This is a simple project to dramatically improve your airborne radio communications with minimal expense and just a few hours work to build a really effective antenna that will increase your radio range and radio signal many times over. The simple design of the Wonder-Whip and ease of use is especially beneficial for paragliding pilots that enjoy cross-country flying to maintain contact with each other and their road recovery teams over much longer distances than previously possible. For PPG pilots, the difference in radio performance (both transmitting and receiving) will be most remarkable. The antenna-tip of the normal rubber-duckie (called "duckie" from here on) is usually too close to the headset, flooding the speakers and the pre-amp with RF energy (Radio Frequency) leading to frustratingly poor communications. Furthermore, on paramotors, the Spark-plug of the engine is positioned far too close to the rubber-duck antenna, introducing much engine noise in the received and the transmitted signal. The antenna can be made for either Airband Radio (AM 118 to 136MHz), or the SAHPA frequencies (FM 141.600 & 141.625MHz). If made for the one, it will still work relatively well on the other band, certainly much better than the duckie antenna. The simple duckie antenna as supplied on handheld radios, is a severe performance compromise in favour of portability and is really only effective over very short distances. When flying, we are not holding the radio by hand, it is usually attached to the harness, which allows for a more effective antenna to be used, whether you reach down to press the PTT on the radio, use a hand-mic, or a headset. Sidebar: I started experimenting with the traditional simple partially-stripped co-axial antennas that many PG pilots have tried in the past but met with similar disappointing results, only to discover that the entire braided outer-wire also radiates, which I did not expect beforehand. Furthermore, the feedline from the radio to the stripped inner-core is not a tuned-length, and because it is radiating, creates an extremely unbalanced wave that propogates in a messy and unpredictable fashion with an unacceptable high SWR (Standing Wave Ratio), which means it is quite useless as a radio-energy radiator. Over time, with input from various sources and ideas from many experts, we gradually converged on this design, only to discover after test-flying the final prototype, that the design has already been developed almost identically elsewhere and is already available for sale commercially but at frightfully high prices. This project is to help you build your own for a few Rands in parts plus an hour or two to build one and fit to your paraglider wing. The Wonder-Whip is essentially a Quarter-Wave Dipole design, which basically means it has Two "poles" or whips, one running vertically upwards from the feedpoint, the other running vertically downwards from the feedpoint, and each of these poles are cut to exactly one-quarter wavelength based on the radio frequency used. It is based loosely on the very effective Zepp antenna design but offers some considerable improvements in terms of performance, ease of construction and ease of use. The co-axial cable (co-ax from here on) serves as both feedline and as radiator rods (the two poles). In fact, a portion of the cable serves functions both at the same time and place! This saves a lot of complicated hardware and construction. Basic Concept: A standard industrial bipole antenna has a vertical metal rod, with the antenna feedline coming in from the side and attached to the center of the rod, dividing it into two, an upper and lower radiating rod. However on our Wonder-Whip design, we use the unique design of co-ax cable to have a simple vertical line from the radio to the tip of the antenna, with a compact coil of the cable itself to isolate the radiating elements from the radio. It is simple, elegent in design and really effective in operation. 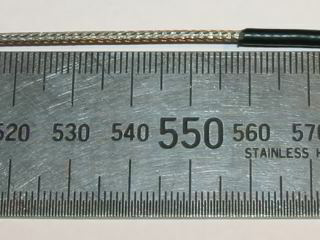 You can choose to make this from RG-58 cable which is widely available everywhere (used in Computer Networks, radio and TV studios, etc) but is fairly bulky (5mm diameter), heavier and more rigid than the preferred choice of RG-174 cable which might be tougher to find, but is only 2.6mm diameter, much lighter and much more flexible. The benefits of the thinner RG-174 cable will become evident shortly. The "Wonder-Whip" is attached to one riser of your wing (Usually the B-Riser) and runs up the inner B-line. It is s left in place on the wing even while packing /transporting the wing. Some thin cable-ties may be used to attach the lower antenna (the feedline) to the B-riser (so as not to interfere with ground-handling) and some heatshrink (or tape) is used to keep the upper antenna (the radiators) running along an inner B-line. In fact, just the tip of the antenna needs to be fixed firmly to the B-line at the correct location to hold the antenna up in flight, however I prefer to use heatshrink sleeve over most of its length, and heat just the very tip to shrink and attach to the line. Note: (Added January 2009) Another (better) method of attaching the upper antenna to the line, is to use thin transparent Spiral-wrap. This has the added advantage of not requirng any heat to fix, and remains more flexible than heat-shrink (and easier to remove). When made and fitted properly, the Wonder-Whip does not interfere with your handling of the wing at all, especially during the critical phase of ground-handling and launching. Acquire about two meters of the RG-174 Co-Axial cable (or RG-58), and one BNC Plug (50-Ohms) of the correct diameter (2.6mm for RG-174 or 5mm for RG-58). First, calculate one quarter wavelength as follows: 300 divided by your frequency in MHz is one full wavelength. Divide this by 4 for a quarter-wave. Multiply the result by 0.93 to compensate for metal (vs air). For example, for 141.6MHz, the wavelength is 2.1186 meters. 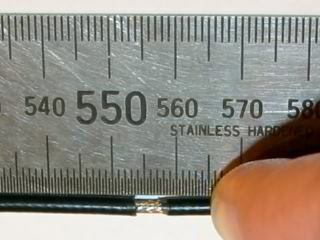 A quarter of this is 529.6mm. Correct by 0.93 gives a final result of a tuned length of 493mm for a quarter-wave on 141.600 MHz. 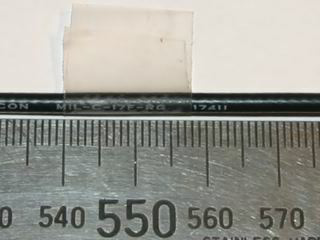 Measure this distance from one tip of the co-ax cable, carefully cut through the outer black sleeve here and remove the sleeve, exposing the outer braided wire. Then carefully cut through the outer braided wire, but be careful not to cut into the white insulation separating the outer braided wire from the inner core wire. Remove the exposed braided wire. You now have a thin white upper radiator of the tuned length (one quarter wavelength). If you are using the thinner RG-174 cable, this should be about the same diameter as a sheathed paraglider line. 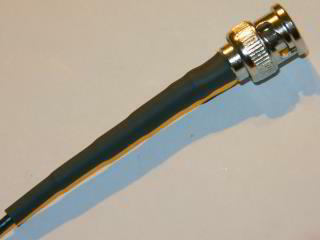 - The feedline is the entire cable from the antenna socket, to where you made the above cuts, i.e. where the cable changes from being intact to being stripped to its inner-core and the white insulator. 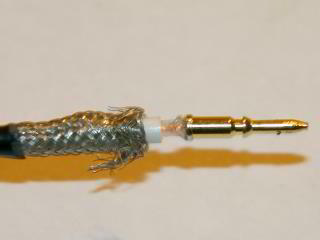 - The feedpoint is at this point where the cable changes from co-axial to a single core. From this feedpoint, the RF energy radiates up along the exposed inner-core (upper pole), as well as downwards along the outer braid (lower pole). However, to stop the outer braid from radiating along its full length all the way back to the radio, we need to construct a simple "RF choke" which sounds fancy, but is simply a tight coil of 5 or 6 turns of the co-ax cable itself. Starting at the mark you made in point 5, using the rest of the cable towards the untouched end, fashion some way to make a tight coil of 5 or 6 turns, with each turn lying alongside the previous turn, not on top of it. 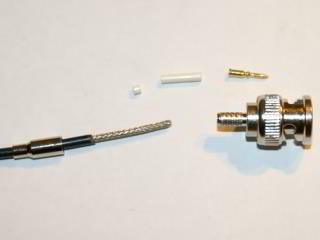 I coil the cable over a round piece or plastic pipe of appropriate diameter. Note: This is where the thinner RG-174 cable has a major advantage, you can make a coil of approx 25mm diameter, whereas the thicker RG-58 cable will not coil as tightly and will make a much bulkier (and heavier) choke. Making this coil and keeping its neat shape is the trickiest part of the construction. Use your imagination here. It does not matter if the coil is horizontal or vertical. You may even run the two ends of the cable through the center of the coil to make it neater. The coil may be slightly flattened into an oval shape to make it more compact. See the pictures for some ideas. 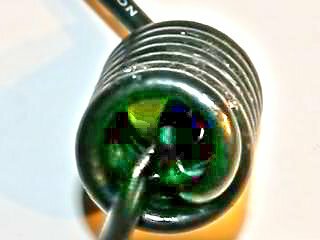 Once your coiled RF Choke is completed, you may stabilise it inside some large diameter heatshrink. From the coil (which will be mounted on the maillon of your B-Riser), you then route the feedline down the length of your B-riser to the bottom of your riser, and allow enough extra length to route from your carabiner to where your radio is positioned on the harness. Cut off the cable here (after making sure you have enough length!). Fit the BNC plug to this end of the cable, and the job is nearly complete. If you wish, use some tight-fitting heatshrink to seal the tip and the feedpoint for weatherproofing. This does not affect the performance at all. Now all that remains to be done is to attach your new Wonder-Whip Quarter-Wave Dipole Antenna to your B-riser, using small cable ties. See the photographs on this page for some ideas. Run the whip up the innermost B-line and attach the tip to this line at the correct height so that the whip is lifted to the full vertical position in-flight. Use masking tape to attach the tip if you wish, however I prefer disconnecting the line from the maillon, fitting some heatshrink measuring approx half wavelength (two by quarter waves as measured earlier) along the line, re-attach to the maillon, slide the whip up inside the heatshrink alongside the line, then shrink just the very tip to fix the antenna tip to the line. (Added January 2009) Or use the plastic spiral-wind method mentioned above, it is quicket, easier, less expensive and more flexible. Note: For even enhanced performance for serious cross-country pilots, you could make both "poles" a half-wavelength, i.e. double these lengths. However, no worthwhile gains can be made above that. How to use your Wonder-Whip: Keep your duckie antenna on the radio for general hand-held use until after you clip into your harness and attach the wing to the harness. Remove the duckie and place in pocket on flightsuit or harness, attach Wonder-Whip to radio. Go fly, have fun and enjoy your new improved radio communications. After landing, before taking risers off harness, detach Wonder-Whip and fit Duckie back onto your radio for general handheld use. Please send me some feedback on the range and quality of your radio communications before and after changing to the Wonder-Whip, to email keith@xplorer.co.za or call/SMS +27 82 414-8448. Personally, I have been able to acheive the following: While flying in Wilderness, I had perfect two-way comms with aircraft operating in Plettenberg Bay! On another occassion I was flying near Mossel Bay and had perfect two-way comms with aircraft over Knysna. From Dolphin Beach, we can hear and chat to other paramotor pilots flying near Muizenberg and even Gordon's Bay. None of this was possible without the Wonder-Whip antenna! If someone feels like making a bunch of these to sell, you should be able to sell these for about R200 per Wonder-Whip (in RG-174 cable) to cover your cost of materials, plus your time and labour. These sell for about $69 in the USA for commercially made versions which sell extremely well to the HAM Radio and Ultralight aircraft markets. I can advise on where to purchase the RG-174 and 2.6mm BNC fittings in commercial volumes. Let me know if you plan to make some to sell, I expect to be flooded with inquiries from those that do not wish to make their own and I have no interest to make these. The research and experimenting was fun, and I built about a dozen of the final product for my local flying buddies, but that was enough for me. I have a bunch of RG-58 cable with the BNC fittings (and rubber boot) already attached for anyone that wishes to make the cheaper version, going for R50 each. All you need to do is form the coil and strip the outer layers as required. For Paramotor Pilots who do not wish to attach an antenna to their wing (you own several wings? ), I have another solution. Though it does not work quite as well, it is still far better than having your rubber-duckie on your airband radio. 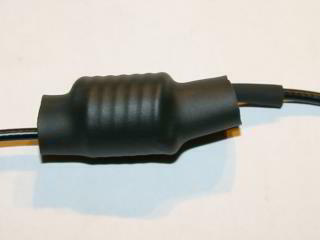 I have a number of RG-58 fly-leads, plus bulkhead-mount male-to-male BNC adapters. You simply make a bracket somewhere on the upper part of your paramotor frame to hold the BNC double-adapter, and run the fly-lead from this adapter down to your radio. You remove the duckie from the radio and place it onto this adapter, which is well above your head and far enough from your head to eliminate the RF interference with your speakers and pre-amp in the headset. This makes for an omni-directional antenna (not shielded by your body when the antenna is directly on the radio). Furthermore, your body absorbs much of the RF energy when the antenna is too close, but by using the fly-lead as an extension-cable to place the duckie above your head, much more of the RF energy is propogated into the atmosphere rather than fragging your cranium... The flylead (with two BNC plugs and boots), is R50 and the BNC bulhead-mount adapter is R35. Call to see if I have any left. 082 414-8448. 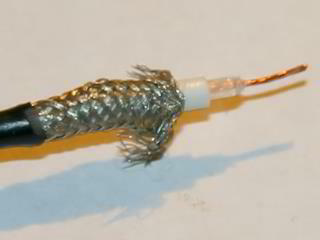 Slip the outer layer off the cable to expose the braided cable, then carefully cut through the braid which slides off easily, leaving the inner core and its outer white plastic insulating layer. From this mark, coil the cable 5 or 6 turns around a suitable object such as this cotton spool. The pins help help to keep it neat (thanks to Martin Calitz for this idea!). Run some super-glue between the coils to retain the coiled shape. Remove the spool, then pass the two ends of the cable through the center of the coil. This way, if you accidentally pull on the cable, it will not pull the coil apart so easily. 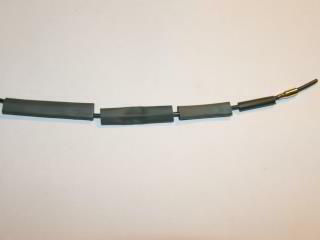 Use some heatshrink to enclose the coil construction. After shrinking the heatshrink, it should be neat, robust and compact. Weatherproof the tip with some heatshrink. 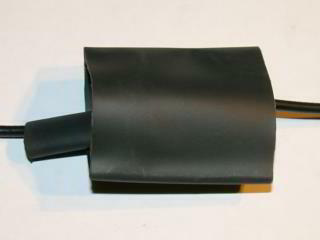 Rubber boots are not avilable in the 2.6mm size of this cable, so to provide stress-relief where the cable exits the BNC socket, use Four lengths of Heatshrink, each one slightly longer than the previous one. 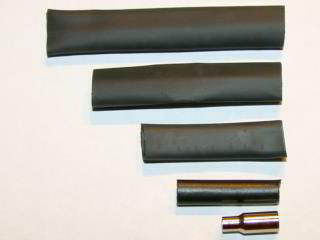 Slide these pieces of heatshrink onto the cable in this order, with the crimp attachment last (nearest to the BNC socket). Slide the 2 pieces of white sleeve (suplied with the socket) over the inner core, so that the braided cable encases them. Remove some inner white insulation to expose enough of the inner core cable to solder to the socket pin. Insert the pin into the BNC Socket and ensure it is pressed all the way until it clicks solidly into place. Check that the pin-tip is flush with the front of the socket. If this is not done, the pin will not make proper contact with your radio's antenna circuit and will malfuntion, possibly damaging the transmitter. 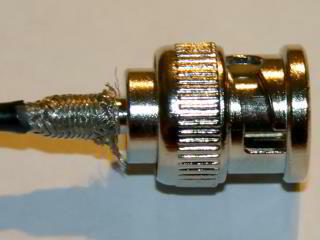 Slide the crimp into place and crimp it onto the socket. Shrink each of the pieces of heatshrink onto the crimp, one by one. 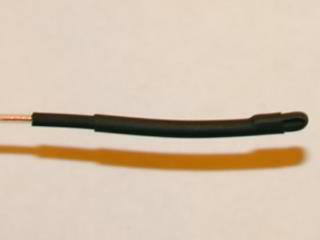 The staggered lengths will cause any bending of the cable to be spread away from the socket, helpin to prevent breakages of the internal wire connections. Final Checks: Using a multimeter set to Ohms, ensure there is no continuity between the center pin and the outer-casing of the BNC socket. Any short-circuit here will cause terrible radio communications and might damage your transmitter. Fit the antenna onto the B-riser of your wing, with the coil as close to the metal maillon on top of the riser as possible. Run the antenna up the innermost B-line, and secure the tip to the line with some heatshrink. Its best to use heatshrink for the entire antenna length, but shrink ONLY the very tip. Do not try a radio check with the antenna in a non-vertical position. Go out and fly and do your radio checks while airborne! Keep the rubber-duck antenna in your pocket for use after landing.